Is Dialect Affecting Your Sales? Walmart & the SCC say Yes. Have you ever been to New Orleans? The food is no less than divine, a true culinary delight. One of the more popular menu items: crawfish everything. Not sure what a crawfish is? Well, if you're from the Midwest you probably know them as crawdads, but if you're from New England like me, you might know them as crayfish. These types of location-based quirks in dialect are no big deal when you're ordering a meal in a restaurant, but how about when you're shopping online for a specific pair of "sneakers" and the retailer has them listed as "tennis shoes"? It's becoming increasingly difficult to find products online and it's all because of...dialect? 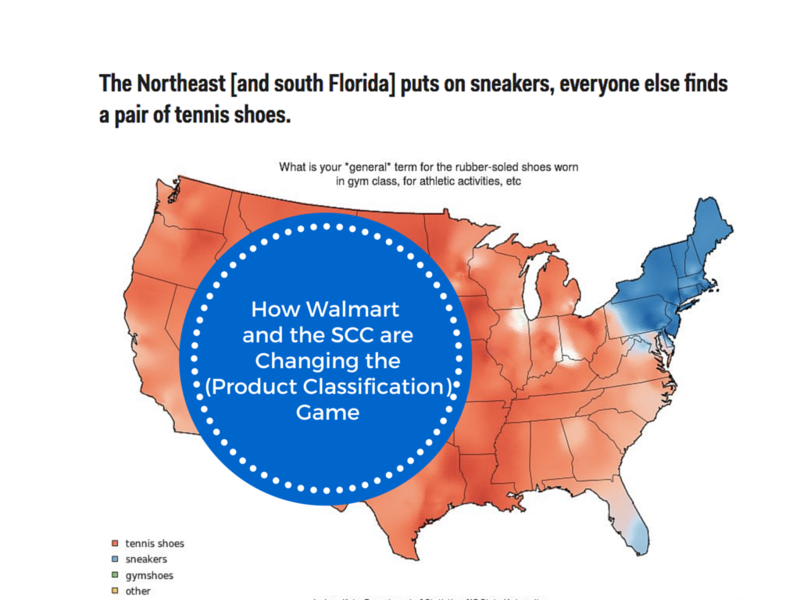 That's what the Walmart and the Structured Classification Commerce (SCC) committee believe, and it's why they're working together with GS1 US to create a standardized set of product classifications that will be utilized country wide to enable more efficient search and navigation for online shoppers. They've even created a video (below) that demonstrates the frustration associated with a lack of standard product classifications. Now, let's be honest, the dramatically diverse dialect of the United States is nothing new, so why is it so important to create a structured commerce classification now? As retailers and suppliers increasingly recognize the importance of omnichannel commerce, they're also recognizing that it requires a higher volume of product information. More often than not, their internal infrastructure isn't equipped to handle it. Creating, exchanging, and managing this product information would be a whole heck of a lot easier if everyone involved was, at the very least, using the same language for every product. Ultimately, the goal of Walmart's initiative is to facilitate a transition from classifying products manually to classifying products automatically using computer programs that run on Rule-Based or Machine Learning. Not only will this speed up the specific process of product classification, but it will also minimize the complications throughout the wholesale/retail process. Imagine how much easier it would be for suppliers, retailers, and consumers if there was one set of standardized terms used to structure e-commerce websites? It would certainly be more efficient to have one way of listing and sharing inventory. It would also streamline data handling and systems interoperability. Last but not least, it would increase product exposure and minimize the stress of shoppers like "Jim" who are trying desperately to seek a specific product and are unable to do so. It's important to understand what Walmart and the SCC are trying to accomplish, but it's also crucial to recognize how this product classification initiative will affect the retail supply chain. 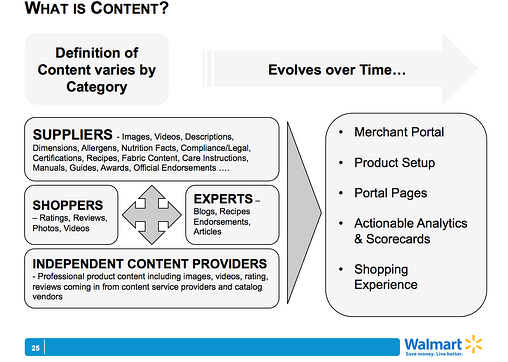 According to Walmart, "for the system to evolve successfully, we need [suppliers to provide] excellent product content." If you currently work with Walmart or hope to do so in the future, it's time to do an internal audit and figure out if your company currently provides retailers with product information that's accurate and complete. If not, don't panic or run out and start frantically collecting information - start from the ground up by building infrastructure that will support a long-term solution to the problem. There's a reason Walmart is trying to eliminate instances in which product information is managed manually: it's no longer effective to do so. If you're still sending e-mailing Excel spreadsheets to your retailers it's time to seek out a new method of creating, managing, and exchanging product information.